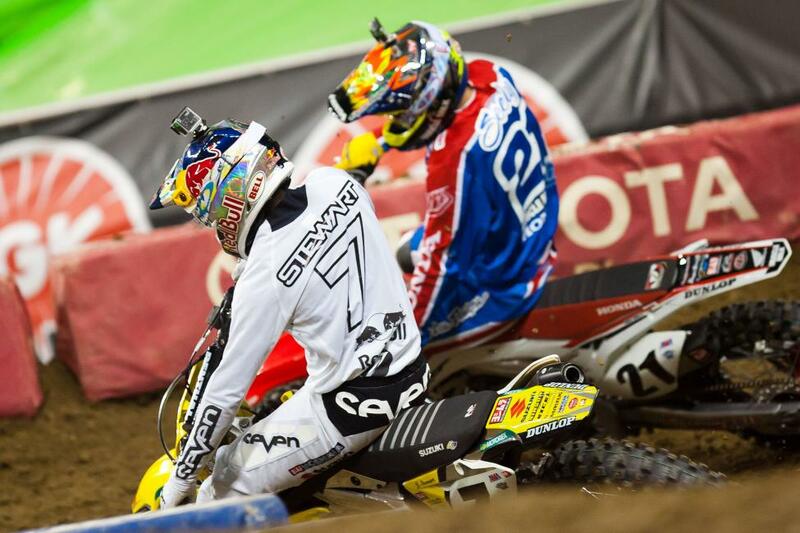 It’s been a trying three rounds for Yoshimura Suzuki’s James Stewart, as he has all but been eliminated from title contention after finishes of 11-7-18, but on Saturday night inside Ford Field in downtown Detroit, Michigan, the Suzuki ride was in pure form. After getting around Muscle Milk Honda’s Cole Seely early, Stewart was flawless in his defense of Monster Energy Kawasaki’s Ryan Villopoto early advances, cruising to his third win on the season. 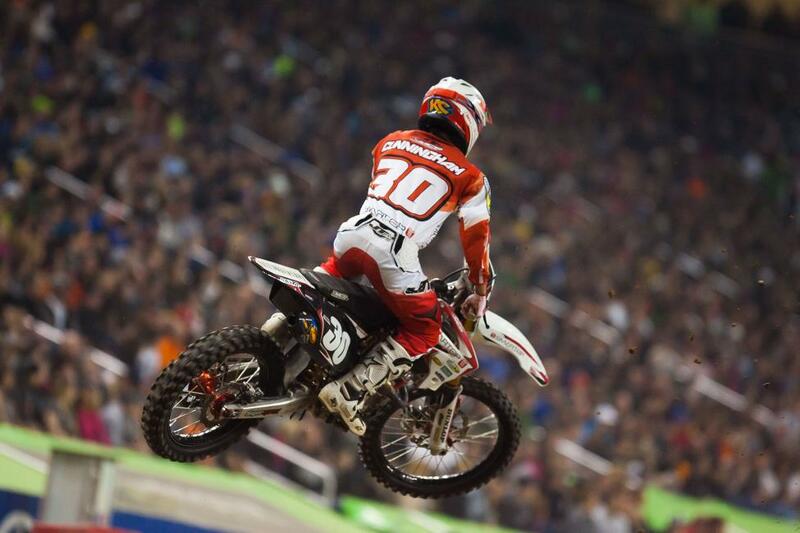 The win was Stewart’s 48th of his career, tying Ricky Carmichael for second on the all-time wins list. 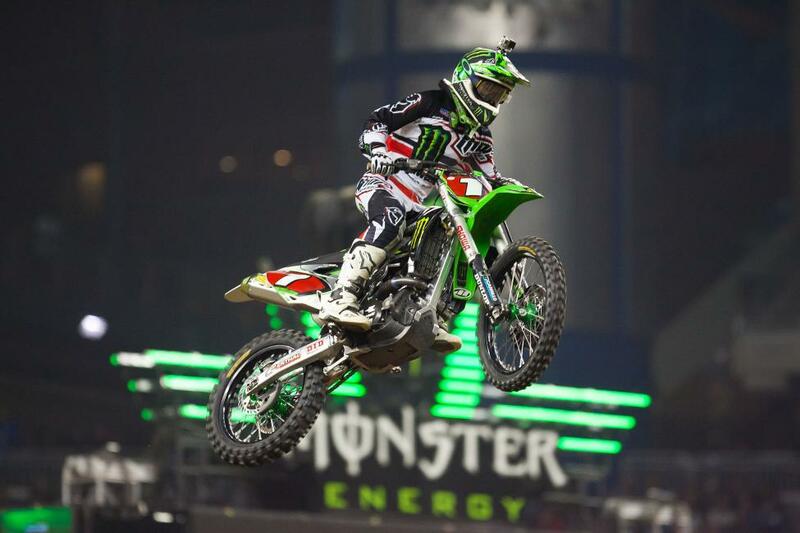 In 250SX, Monster Energy/Pro Circuit Kawasaki’s rookie sensation Adam Cianciarulo capitalized on early mistake by teammate Martin Davalos to hold off GEICO Honda’s Justin Bogle for his third win of the season. 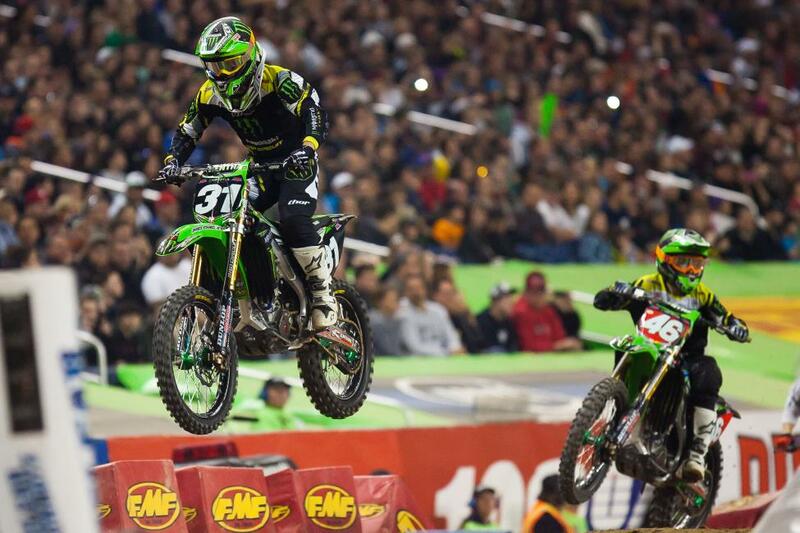 Cianciarulo now holds a seventeen-point lead over Davalos with four round remaining in the East Region. Early leader Cole Seely was running fourth before tangling with BTOSports.com KTM’s Andrew Short late in the race and hitting the ground. 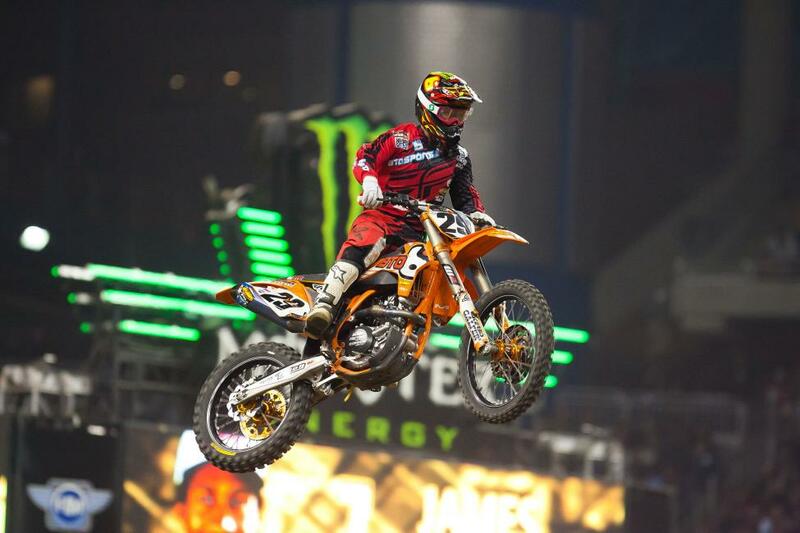 Andrew Short continued his recent run of great racing with a fourth in Detroit. 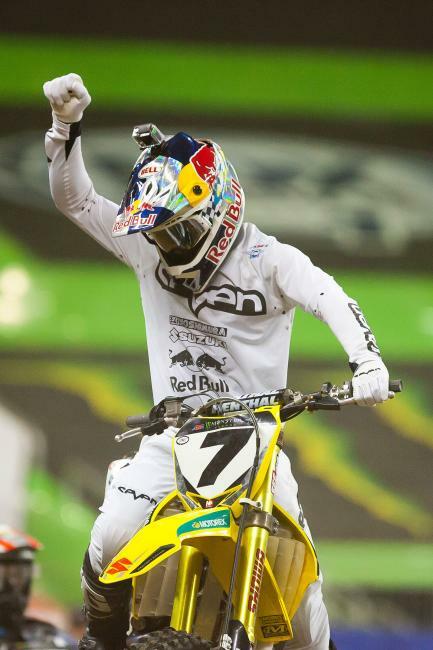 Stewart joins Ricky Carmichael for second on the all-time supercross wins list with 48 career wins. Following a big crash in practice, Martin Davalos would rebound to win his heat race and control the early lead over teammate Adam Cianciarulo. They tried to bring a bit of old school Pontiac, Michigan supercross to Monster Energy Supercross’ return to Ford Field in Detroit, even taking the track up into the stands like the used to do in Pontiac. But what was missing was the ultra soft and rutted dirt that used to be a trademark of the Pontiac races. Instead the Ford Field dirt was super slick and hard, which meant the whole night came down to mistakes. Plus, the track was too simple to really offer much variety or passing spots, so there wasn’t much going on in the races. When James Stewart comes in from practice and feels like his bike is close on set up, he’ll tell the team they just need to “add a little salt and pepper” to make it perfect. He did make some changes throughout the day and had it dialed in just right for the main, where he grabbed a good start, took the lead from Cole Seely and steadily pulled away. Seely nailed the holeshot in his heat and the main, another strong showing from the fill-in for Trey Canard on the Muscle Milk Honda. 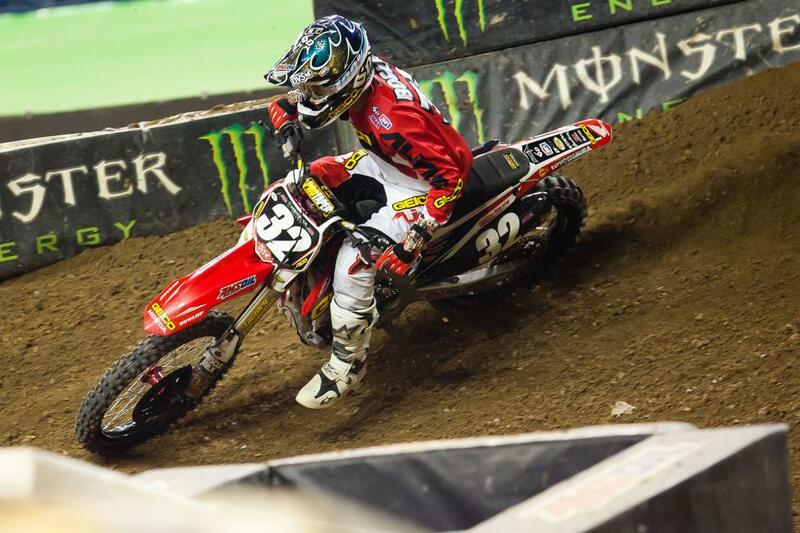 Seely said he likes to start closer to the dog house in the center of the start instead of crowding around the inside like most riders, and on this night it worked. 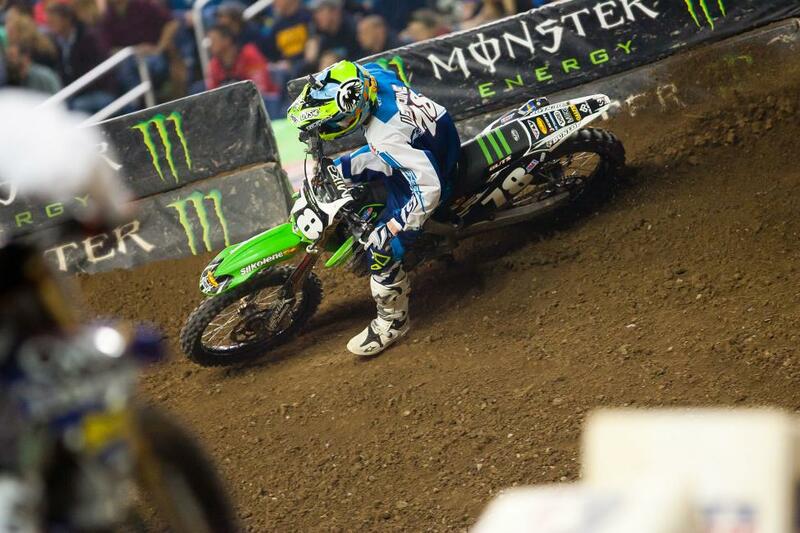 He led the main for a bit, then Stewart, Villopoto and Dungey got him. Hey, those guys are expected to be on the podium. Then came the real battle, with a whole pack of riders gunning for fourth, and then Seely came into contact with Andrew Short and went down, ending his run up front. Seely says the move was dirty, but Short did make the same pass earlier on Dean Wilson, who checked up and didn’t make contact. We’re going to guess this is episode 196,756 of two riders seeing things differently. Dude, Shorty! He was in the battle all the way and not only scored a season-high fourth, but a season-high legit fourth. There was a torrid battle between what seemed like five or six riders the whole way, the likes of Seely, Wilson, Barcia, Tickle, Hill, Peick…Shorty made the moves that mattered most. 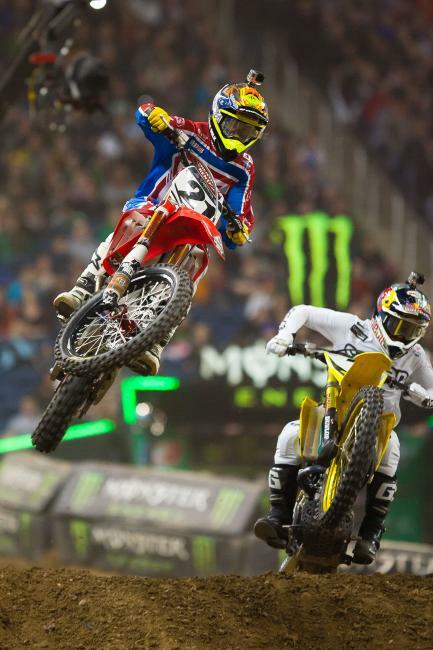 At one point Barcia even dove underneath him and took the spot away but Shorty got it back and hung on for fourth. Ryan Dungey didn’t get a good start but was able to rally up to third by making a few quick moves. He had a different rhythm down the longest rhythm lane than most of the field, and it didn’t seem to help. Dungey says the team had timed it out from practice, and there was a technique his teammate Ken Roczen had used to wheelie and blitz over it that was very fast. 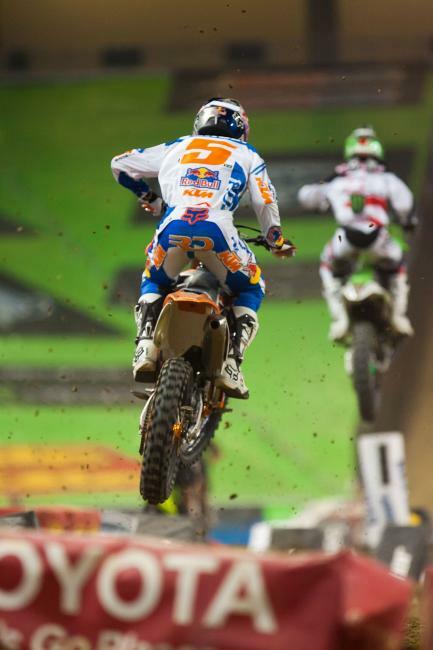 Dungey tried it but couldn’t quite nail it the same way, and then he doubled into a corner where others tripled. As for Roczen, some bad luck here when a rock jammed into his rear brake disc, putting him a lap down early. He rode well once he kicked it clear but was too far back to do anything. He finished 20th, and now Stewart is back to third in points. Broc Tickle’s recent run of strong riding continued with a solid sixth, and he was going after Barcia for fifth down to the last turn. Also a decent night for his teammate Soaring Eagle Casino RCH Suzuki teammate Josh Hill, who was eighth. Soaring Eagle Casino, by the way, is located not too far from the stadium so it was a big weekend for the team. 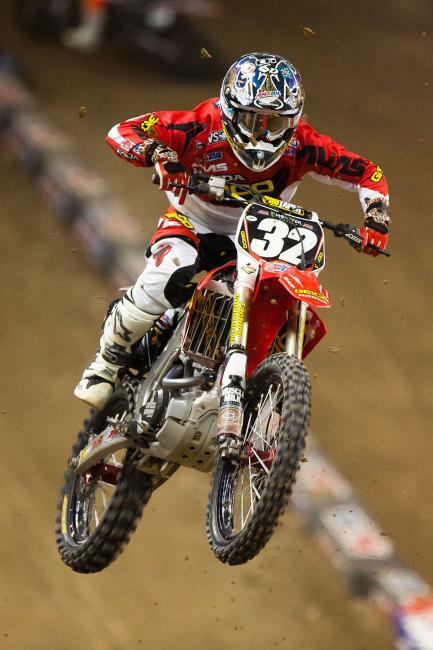 A second in 250s was a career high for Justin Bogle. When Weston Peick crossed the finish sixth in his Semi, sending him to the LCQ, he was not happy. Peick’s dealing with a bad ankle and a bad back and also had a big crash (while running fourth) in his heat race. But he just did what he does, channeling all of that anger into a solid finish of seventh in the main, his best result since San Diego. Wil Hahn went down on the first lap then, as he said, “just stayed there.” He had other falls end any chance of a good result, and finished 14th. 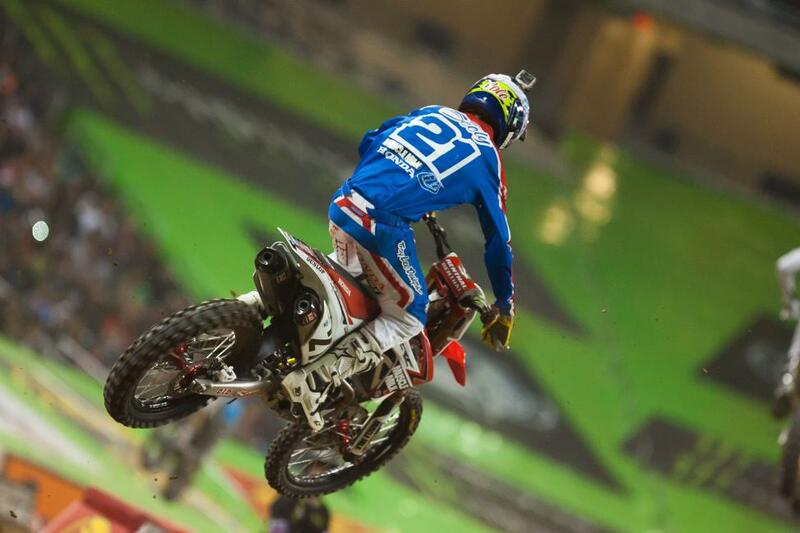 Dean Wilson still has problems with arm pump, and that ruined his night. Too bad, because he was fastest in the final 450 practice session. After running third early he dropped back to 12th. 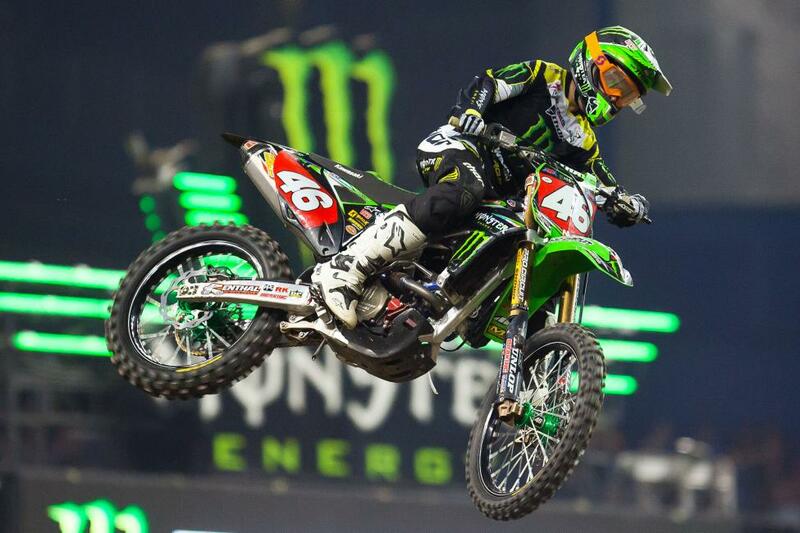 What can you say about Adam Cianciarulo? The rookie is just solid. He was smart on the slick track, and pressed his teammate Davalos for the lead until Davalos went down. From there, he fended off heavy pressure from Bogle to win his third race of the season. Bogle was darned good, though, and his second was a career high. 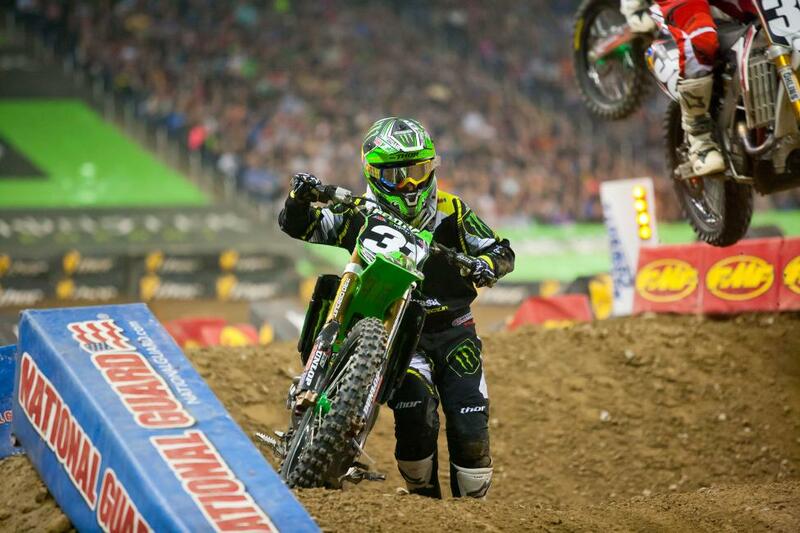 He was threatening Cianciarulo for about 12 laps before finally losing a little ground down the stretch. Bogle says he’s just feeling better now that he’s gotten a few races under his belt—remember he missed all of supercross last year with an injury. A huge crash in practice turned the night into one of survival for Martin Davalos, and more issues in the main didn't help. Once Davalos went down, the door was open for any number of privateers to net a podium. Jimmy Decotis, who has been very fast this year, had a shot at it and was battling with Kyle Cunningham for the position, but they made contact and Decotis went down. He finished tenth. Cunningham’s fourth was a season high, but he did lose a spot to a charging Blake Baggett, who stole third after not getting (another) terrible start. 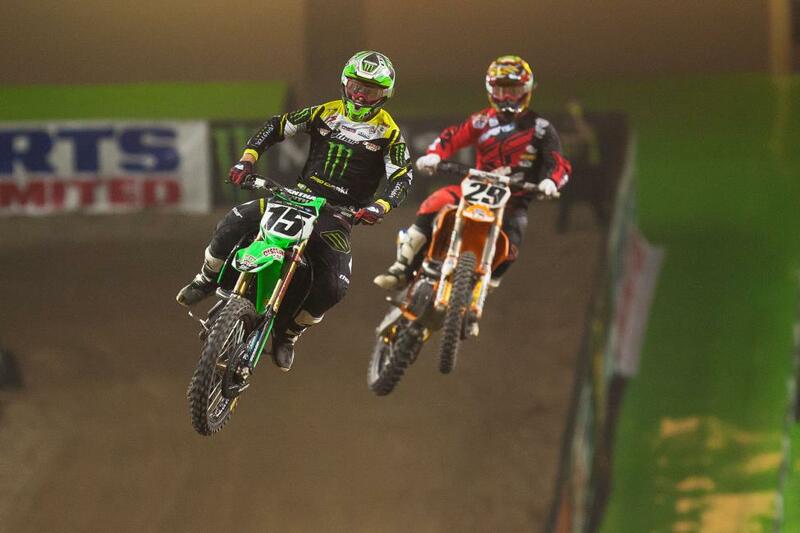 These starts don’t cut it in supercross! Gavin Faith was also running up front early and also even won his heat race! But he lost the pace late in the race and dropped back to 13th. A rock jammed into Roczen's rear brake, which cost him any chance of a good finish. Davalos crashed badly in practice, and was lucky to walk away from the big endo and even race at all. 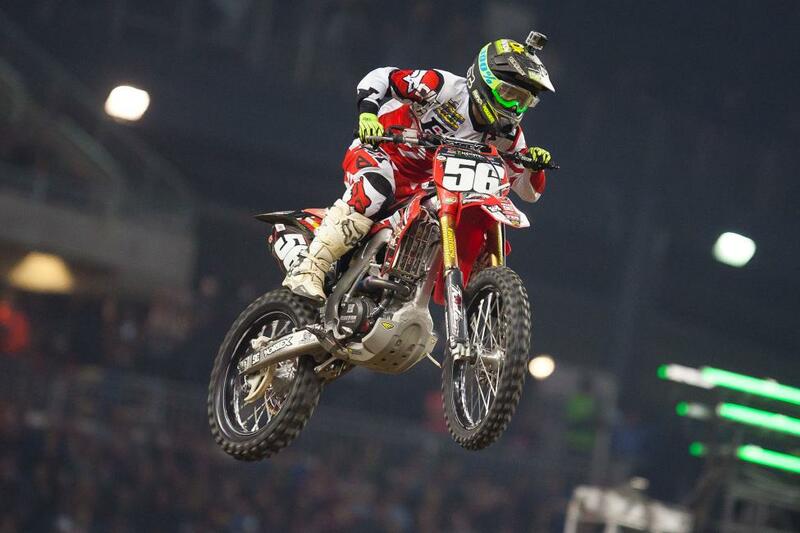 He was good in his heat (come on, it’s Davalos) but wasn’t the same in the main event. He led early but couldn’t shake “the kid” and then crashed, and crashed again. He finished 6th. Oh geez, more bad luck for Jeremy Martin. He crashed in his heat race and had to make the main through the LCQ. He then got tangled with Matt Bisceglia in the first turn of the main! 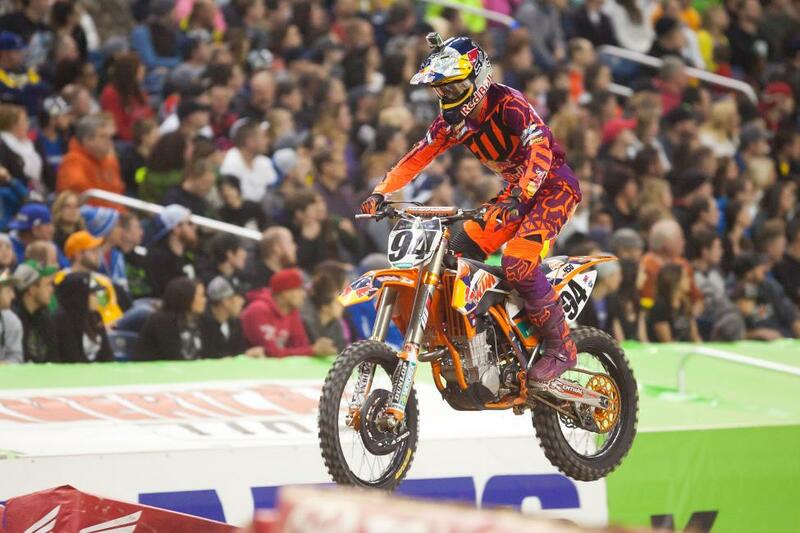 He battled back through for eighth—so now he’s riding pretty well but the results continue to not show it.